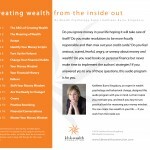 I’ve had a CD in my foyer for a number of months called, “Creating Wealth from the Inside Out.” The CD was done by Kathleen Kingsbury, a wealth coach. I’ve had a number of clients want to purchase the CD for friends and relatives. Obviously, I only have one and it was a gift from Kathleen as I endorsed the CD for her. However, if you will click here, you can go to Kathleen’s website and download the CD for $14.95 or purchase it for $29.95 (including shipping). In Creating Wealth from the Inside Out, you will learn easy, practical tools and techniques for examining and changing your money mindset to support wealth creation in your life. The program is based on Kathleen’s twenty years of experience as a behavioral change specialist in the field of psychology, her financial industry education and background and her personal experience shifting her own relationship with money.